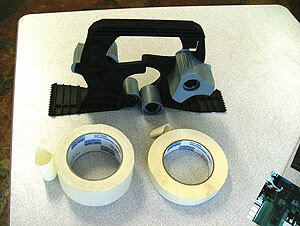 Using the right tape for the job gives painters professional results and makes the painting job a whole lot easier. 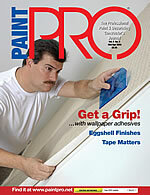 Painters should avoid using inferior-quality masking tapes for their projects. They result in poor paint lines, tape slivering and surface damage. Unless you have an extremely steady hand and the patience of a saint, taping is a regular part of your painting ritual. For most contractors, freehanding just slows down the process, so using the right tape for the job becomes imperative to a project's overall success. Luckily for painters, there's a plethora of masking products available, from "workhorse" tapes that can be used for many applications to project-specific tapes made for everything from lacquer and stucco to rough surfaces and those as smooth as glass. There's even tape made especially for corners. 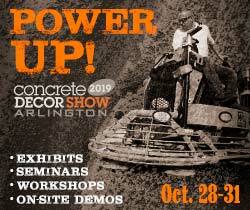 "Day tapes are designed to be used for one, three, five, eight, 14 and 30 days," says Trent Starnes, product manager of retail and professional paint for Shurtape, a company headquartered in Hickory, N.C. "That's how most contractors identify our tape. They come in looking for a certain 'day' tape." But that's not the only factor to consider. Some 30-day tapes have a light adhesive and are designed to be used on delicate surfaces such as wallpaper. Other 30-day tapes are designed to be used outdoors and are made to be cleanly removed after a month. These weatherable tapes can withstand high temperatures and rain. Most companies, such as 3M, note what the tape is "ideal for" in addition to how many "days on" a surface the tape can remain and still remove cleanly. Most companies that manufacture painters' tapes offer them in four primary widths: 18 mm (3/4-inch), 24 mm (1 inch), 36 mm (11/2- inch) and 48 mm (2 inch). Starnes explains that his company, as well as others, stresses the metric measurements — although most painters will still request widths in inches. In addition to the basic widths, "We've got tape that goes down to 6 mm in width. That's barely 1/8-inch wide," Starnes says. Shurtape also carries �-inch tape, which may be used to create grout lines in some faux finishing jobs, in its pro paint and industrial lines. It's no secret that most general-purpose masking tape is beige. To help make their products stand out, several companies color-code their tapes for easy identification. In Shurtape's Painter's Mate line, for instance, the Green Masking Tape can be left up for eight days in the direct sunlight with no adhesive transfer. Painter's Mate Delicate masking tape, which can be used on wallpaper and left up for 30 days, is tinted a light green. Intertape's eight-day tape is also green, says Jeff Coats, product manager for Intertape Polymer Group, a manufacturing company with headquarters in Montreal, Quebec, and Sarasota/Bradenton, Fla. "It's a more economical version of our UV-resistant blue tape with a different adhesive," he says, "It can be used in general applications when a 14-day clean removal time isn't required." Both are good for windows, trim and even faux finishes, with excellent results. "Blue tape has traditionally been a UV-resistant tape designed to be used outdoors," Coats says. "But it found its way indoors. Color choices are left up to the individual manufacturer." To make its product immediately recognizable, 3M offers a line of blue tape in widths from 1/2-inch to as wide as 3 inches, most of which are coated with a medium adhesion. 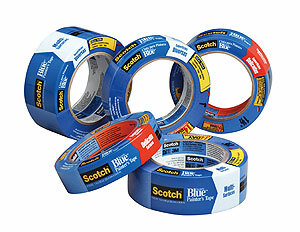 "Scotch-Blue painter's tape for multisurfaces can be used in dispensers and applicators to speed up prep work," notes Amelia Hardy of 3M's construction and home improvement division. "It can also be found in die-cut form to protect hinges and assist in masking corners." Unlike general-purpose masking tape that is less giving, painter's tape tends to be flexible, says Mike McCalden, director of product management for Intertape. "And that's very important to conformity." "Regular masking tape can leave residue upon removal," Starnes says. "Painter's tape is designed with a special adhesive that allows clean removability." 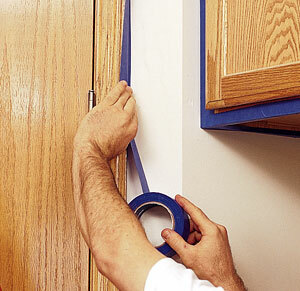 A good painter's tape will produce clean straight paint lines with little edge bleed or seepage. Experts in the industry agree that the sooner the tape is removed after a job is finished, the better overall results you'll get. The longer the tape stays on, the stronger the bond to the surface. "Residue and lockdown are two big problems if you leave the tape up too long," Starnes says. When you pull it up, it's better to do so at a 90-degree angle for a crisper line. It should come off in one piece, leaving no slivers behind. Using the right tape for the job gives painters professional results and makes the painting job a whole lot easier, says 3M's Hardy. "Painters should avoid using inferior-quality masking tapes for their projects, because they can result in poor paint lines, tape slivering on the surface and surface damage. These poor results can be very costly and time intensive to fix." And as we all know, time is money. In short, a little tape can go a long way to help increase your profits.